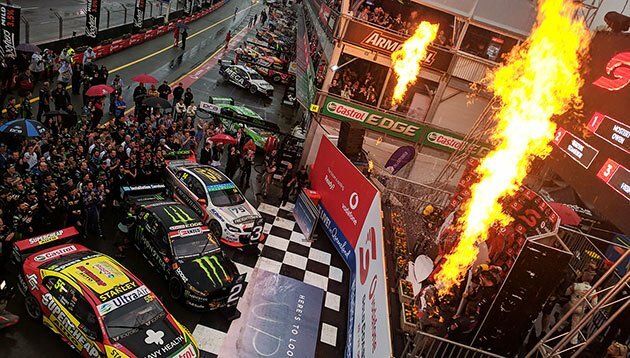 The Vodafone Gold Coast 600 marked our first race attendance as an official partner. 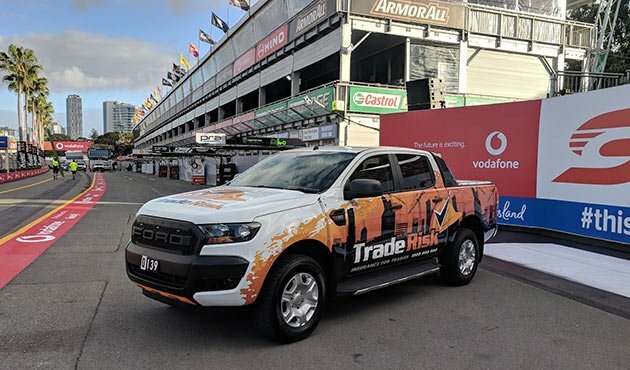 Trade Risk is an official partner of the V8 Utes series, which runs as a support category to the Supercars. It was a super early start to the event, as we needed to be on track with our Ford Ranger before 6am Friday. The reason for the super early start was not only because the Ranger was to be on display within the precinct, but also because we had arranged a photo opportunity in front of the famous Gold Coast podium. The results were definitely worth it! After the photos we were able to do a lap of the closed track, but it was mighty slow given the work that was taking place around the track. It was interesting though. 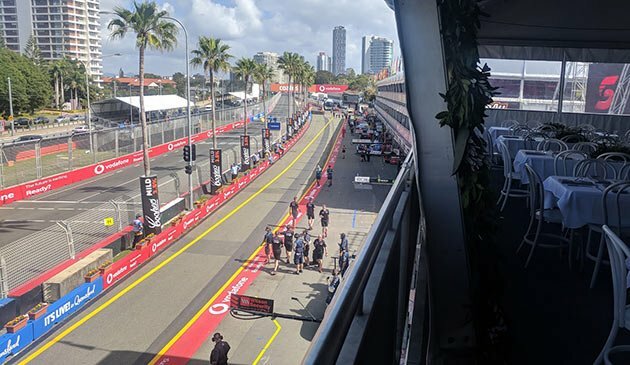 After enjoying breakfast with Jesse, who works for Supercars and helped put our deal together, it was off to check out our home for the next few days in the Virgin Paddock Club. Located right above the pits, it was a brilliant spot to enjoy the race from. Being fully catered with food and drink was also a great bonus! It was also the perfect location to watch the podium celebrations from. The giant flames were unexpected, but very welcome given the cold and wet weather on Saturday. To get to the lounge you have to make your way past the rear of the Supercar garages, which is quite a cool experience on its own if you’re a real fan of motorsport. A short time later on Friday morning we were off to the V8 Utes pit area to shoot a TV interview. 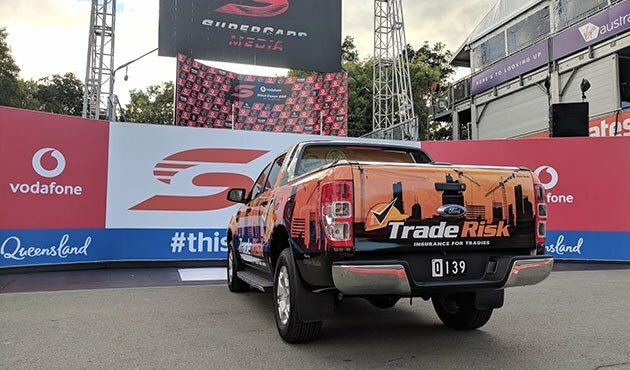 The interview focused on what Trade Risk is all about, and why we’ve partnered with Supercars. 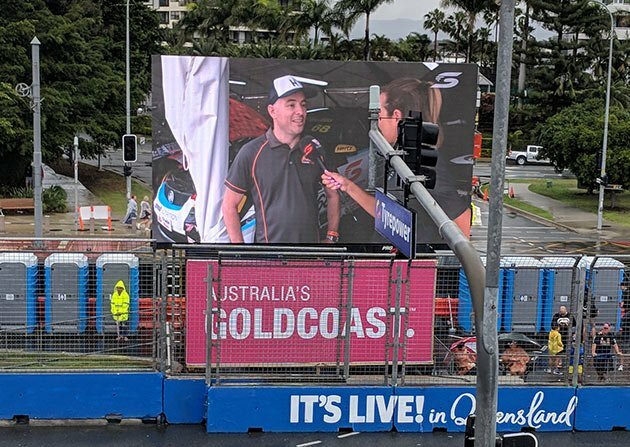 Once the interview was cut together it ran all weekend on the big screens as well as the TV screens in the hospitality areas. The remainder of Friday was all about enjoying the event. 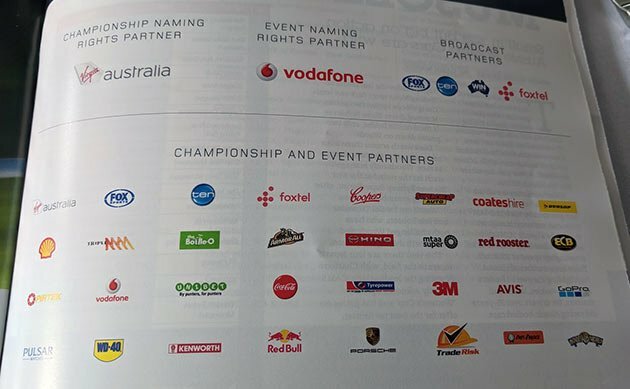 I also managed to get a look at the official event program, and it very cool to see our Trade Risk logo amongst so many other huge household names. 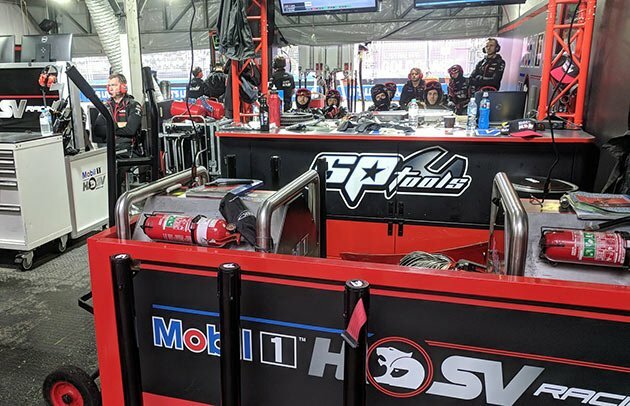 Whilst our logo might look a little out of place next to massive global brands such as Red Bull and Porsche, we’ve definitely earned our place on there! Saturday brought the rain, which ordinarily would have been a nightmare, but in the Paddock Club it wasn’t so bad. 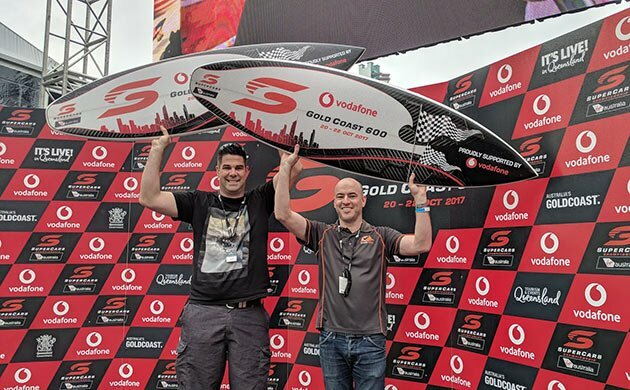 Myself and my guest enjoyed some great Supercars experiences on the Saturday, including a behind-the-scenes tour through the facilities and a trip up onto the podium with those iconic surf board trophies. Hopefully that’s not the last time the Trade Risk logo appears on the podium! 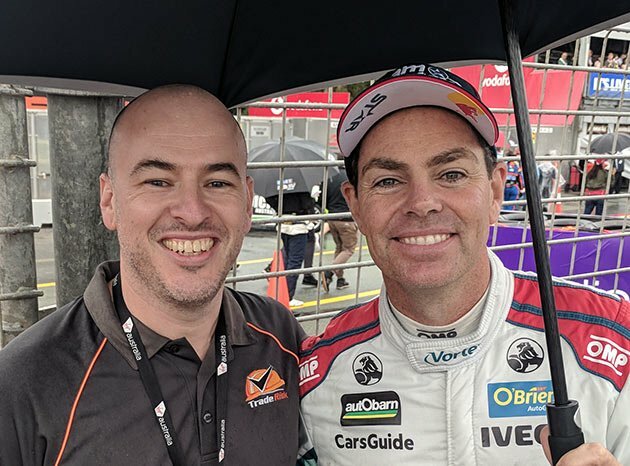 We also enjoyed a grid walk right before Saturday’s Supercar race, where we were able to rub shoulders with some legends of Australian touring car racing. After a very wet Saturday, the weather was brilliant Queensland at its best on Sunday. 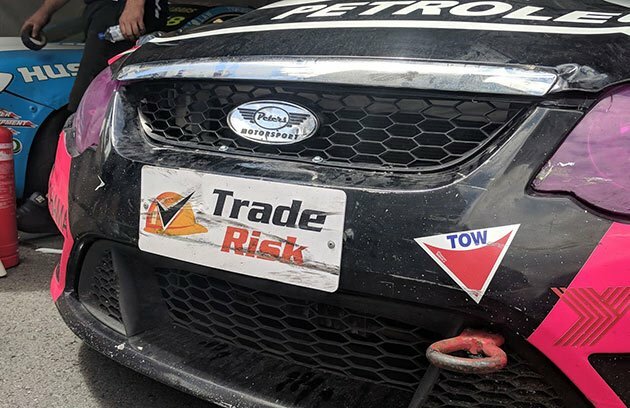 The ute races were super entertaining, and our Trade Risk number plates ended the weekend looking a little worse for wear! After all the action of the weekend was over, much of Sunday evening was spent sitting in the Trade Risk Ranger. Being parked on display within the track all weekend was great, but it did mean having to wait around for hours before we could make our exit. It was all well worth it though. What a weekend! 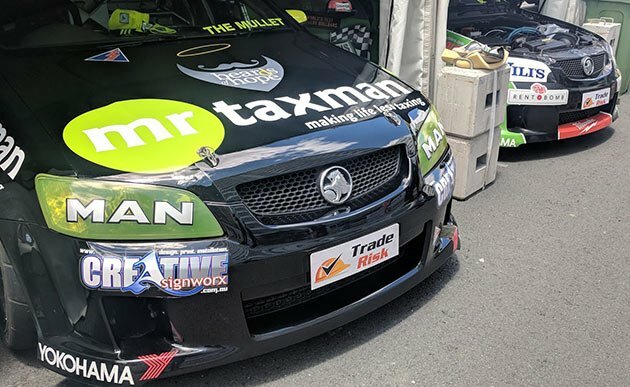 The Supercars are now off to New Zealand, and we’ll see the V8 Utes for their last ever race next month in Newcastle.